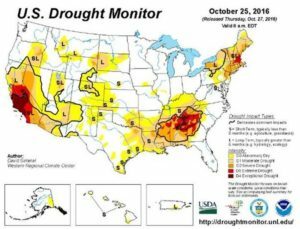 This U.S. Drought Monitor week saw deterioration in drought conditions across the South and Southeast in an area extending from South Carolina westward to eastern Texas and northward into Tennessee. 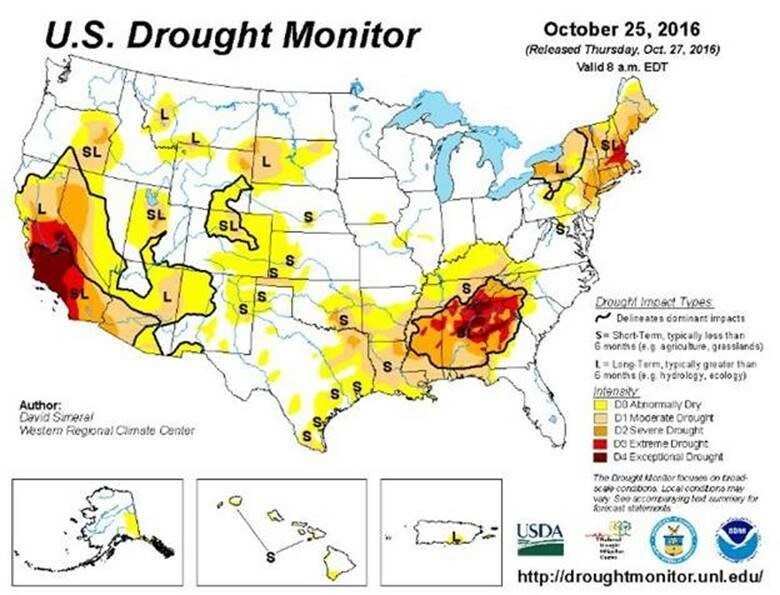 In the Southeast, a persistent dry weather pattern during the past 60 days continues to negatively impact the agricultural sector as well as hydrologic and soil moisture conditions across much of the region. Elsewhere, significant rainfall accumulations (two-to-six inches) were observed in the Northeast during the past week helping to improve drought-affected areas of western New York, Connecticut, Maine, and Rhode Island. In eastern Ohio, western Pennsylvania, and West Virginia, locally heavy rainfall accumulations led to improvements on the map. Out West, one-to-five inches of precipitation fell in western portions of Oregon and Washington. Recent storm events in the Pacific Northwest during the past 30 days led to improvements on the map in drought-affected areas in Oregon and Washington. (NTV) Drawing comparisons to the dust bowl days of the 1930s, the lingering drought takes a toll out in south central Nebraska. An area of drought stretches from Holdrege to Grand Island, and farmers in that area sure have noticed. It may not be widespread, but meteorologists say it’s actually pretty staggering. The bullseye is right over Minden, where they have received a little over five inches of rain since June, which is a third of what folks would normally get. As bad as it is in some areas, the rainfall amounts vary greatly. Meteorologists say it could linger into the next growing season on the farm.